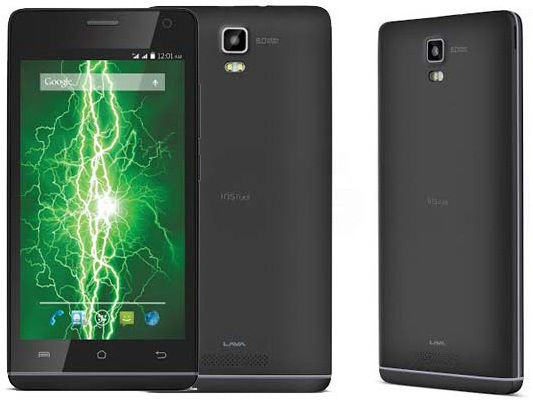 Lava, the domestic mobile-phone brand has today launched its another cell phone under its ‘Iris Fuel’ series. It is known as ‘lava Iris Fuel 60’, which is valued at Rs 8,888. The real fascination of this smartphone is its 4000-mAh Li-polymer battery, company also claims that their new phone would offer a long-lasting conversation experience & it would take only 3 hours & 15 minutes to hit the full charge from scratch. However, I have reserved our opinion till the time I spend sometime with phone. Along with the large battery backup, this phone is running on the Android KitKat 4.4 and is powered by 1.3-Gigahertz Quad-Core Cortex A7 processor. Random Access Memory (RAM) of the device is 1GB RAM and Read Only memory (ROM) is 8GB. The company also mentioned that their device will be upgraded to latest Android Lollipop in the future, but it haven’t stated exact time for it yet. The smartphone is having a 5-inch High-Definition IPS display with the scratch-resistant Corning Gorilla Glass 3. It also comes along with the (720 x 1280) (HD) resolution, with which the company hopes to offer a rich & sharp display. Lava Iris Fuel 60 is packed with rear camera of 10 megapixels along with single LED flash as-well-as 2 megapixels front-facing camera. Looking at the connectivity aspect of smartphone, the dual-SIM device is equipped with 3G connectivity apart from Bluetooth v3.0, Wi-Fi, USB OTG support.